The visionaries have already several times declared that it is impossible to describe in full detail how the "Queen of Peace" looks. Her beauty surpasses our every attempt. Since it is so difficult for them, naturally it is still more difficult for us who have never seen her. On these pages we will try to convey what the visionaries have so far expressed about the image of the "Queen of Peace," as well as that which various artists have tried to produce on the basis of that. 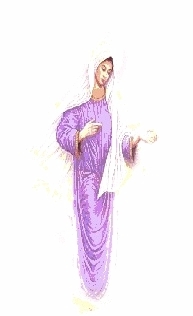 We will be pleased if these pages inspire someone, with the help of God, to endow us with a still more beautiful picture or image of the "Queen of Peace." Time has passed and attempts at portraying Our Lady have multiplied. Many of those attempts have been contrary to what the visionaries have said. Fr. Janko, although up in years (born 1913), made another attempt. He sent a survey sheet to the visionaries in which he interrogates them about Our Lady's appearance. Most of the visionaries responded to Fr. Janko's attempt (Ivan Dragievi, Vicka Ivankovi, Marija Pavlovi Lunetti, Ivanka Ivankovi Elez, and Mirjana Dragievi Soldo). They testified to the survey number of their own answers by personal signatures at Humac in 1992. Jakov Olo did not fill out his survey sheet for justifiable reasons, but he agrees with what the others visionaries said and had nothing special to add. 1. As the first thing, tell me: how tall is the Madonna, that you regularly see? 2. Does she look rather "slender", slim or… ? 6. When Our Lady is with you is she always standing or always standing. 8. What color is that little cloud? 11. What color is her face? 12. What color is her brow? Normal - mainly like her face. 14. What color are they'? Ordinarily she doesn't - perhaps a little, if she smiles (Mirjana). Maybe - more like some indescribable gentleness - there's a smile visible as if somehow under her skin (Vicka). 17. What is the color of Our Lady's eyes? Her eyes are wonderful! Clearly blue (all). 18. Are they rather big or ? More normal - maybe a little bit bigger (Marija). 19. How are her eye-lashes? 20. What color are her eye-lashes? Normal - no special color. 21. Are they thinner or ? 22. Of course, Our Lady also has a nose. What is it like: sharp or ? A nice, little nose (Mirjana) - normal, harmonizing with her face (Marija). Her eyebrows are thin - normal - more of a black color. 25. What color is her dress? Her dress is grey - maybe a little bluish-grey(Mirjana). 26. Is the dress pulled in around the body or does it fall freely. 30. How far do her sleeves reach'? Of course it's noticeable! But nothing specially (Vicka). 35. What color is that veil? 36. Pure white or ? 41. Is there any kind of jewelry on her? There is no kind of jewelry. 42. Is it trimmed with anything at the ends? 43. Does Our Lady, have any kind of ornament at all? Ordinarily there are - there always are (Vicka). 48. What color are they? 52. What color is it? 53. Is either of Our Lady's ears ever visible'? 56. How does Our Lady hold her hands about her? Her hands are free, relaxed extended. Almost never - maybe sometimes at the "Glory be." Her palms are usually relaxed upwards - her fingers are relaxed the same way. 61. How are they - which color are they? Natural color - clean cut fingernails. Well, really we haven't told you anything about that - her beauty cannot be described - it is not our kind of beauty - that is something ethereal -something heavenly - something that we'll only see in Paradise - and then only to a certain degree.